Last Saturday I decided I needed a much deserved break before going to the supermarket. It takes a special kind of courage to do the weekly groceries shopping in the local, overcrowded supermarket. 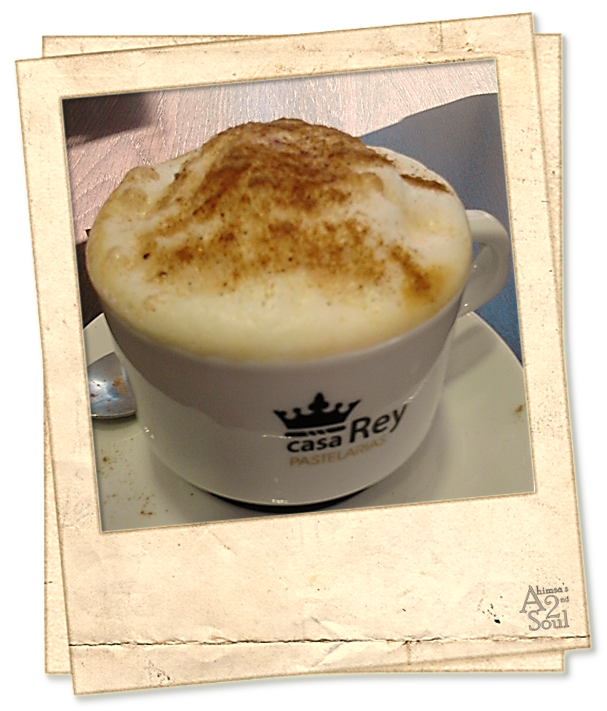 So I made a stop at “Casa Rey”, the neighbourhood coffee shop where I’m know for my sweet tooth. Since I’m quite sensitive to caffeine, I do not drink the typical Portuguese “bica” (espresso), but instead the “meia de leite” (a cup of coffee with milk). Usually I ask for a “meia de leite clarinha e morna” which means a lukewarm, more milk than coffee drink. Rarely do I get what I asked for: it’s either lots of milk, not much coffee, but scalding; or practically cold, but barely no milk and lots of coffee. Somehow, part of the “meia de leite clarinha e morna” formula is lost. This time around, I decided to go “Sally” about it, as in the Meg Ryan’s character in “When Harry Met Sally”, thus describing in detail my order: “I would like a ‘meia de leite’, please, but could you prepare it as follows? I just want a third of coffee, two thirds of milk and lots and lots of milk foam, please. And lukewarm, too, please”. The waitress smiled, said a laconic OK and began to prepare my order. As she brought the “meia de leite” to my table, I wowed: it was beautiful! She took it quite literally the whole “lots and lots of foam”. I smiled and thanked profusely. As she was about to put the cup on the table she asked “Would you like some cinnamon or chocolate on top?”, “Why yes, I’d love some cinnamon, please”, I replied giddily. Not only the “meia de leite” looked beautiful, but it was delicious too: a third of coffee, two thirds of milk, lots of foam, and truly lukewarm. As I paid I told her it was the first time, ever, someone got the order right. She replied modestly, it wasn’t that peculiar a request. So there you go: want to be treated like a Princess? Go to the King’s House (Casa Rey)!